I do this all the time. 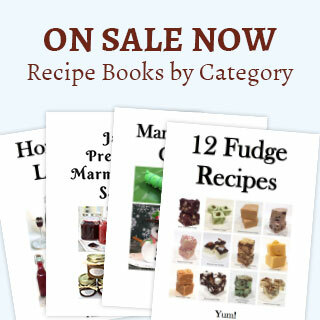 I find I decide to make something, and it leads to many other recipes in the same genre. Such is the case with this Homemade Crème de Menthe. It all started with my homemade coffee liqueur and then I had other ideas. Does that mean other easy liqueurs are on the way? You bet. Besides, the holidays are coming up fast, and these homemade liqueurs are handy to have around for guests and as gifts. Now let’s get to making my Homemade Crème de Menthe. 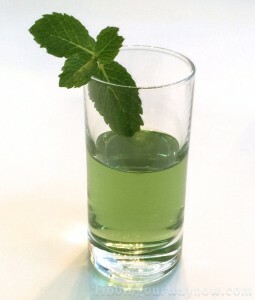 Garnish: Whole mint leaves, green colored sugar to rim the liqueur glass. 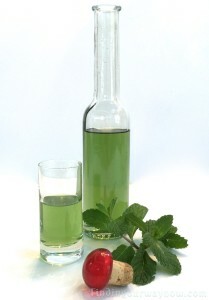 Directions: There are two ways to steep the mint leaves to extract their essence and gain a good infusion. The simple syrup infusion is less pronounced regarding the alcohol. The mint leaves steeped in the vodka is more vodka forward. Either way works. 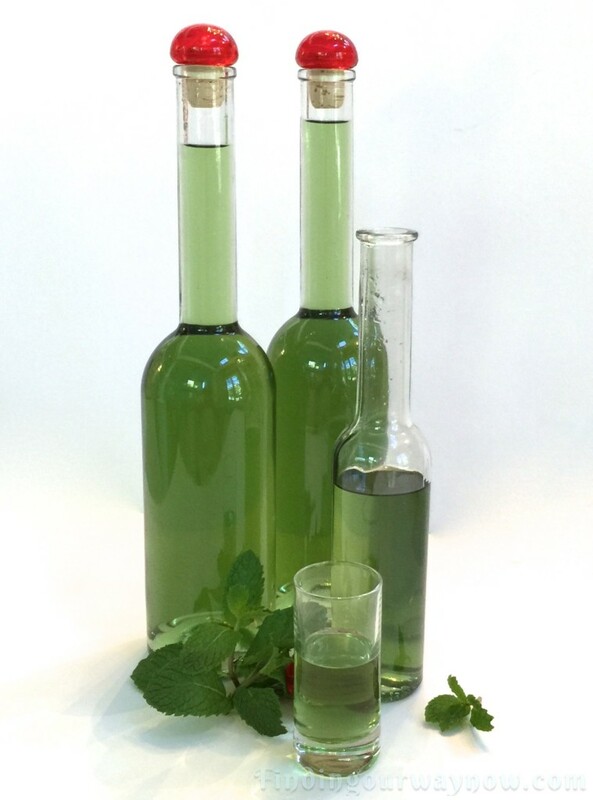 Over time, each will mellow out providing a smooth minty flavor in the liqueur. I’ll leave it to you as to what way you would prefer. Thoroughly wash then destem the mint. In a medium saucepan, combine the water and sugar. While stirring, bring to a boil and then reduce the heat to a simmer and continue to stir until the sugars are completely dissolved making a simple syrup. This will take about 5 minutes. Move the simple syrup off the heat and allow to cool to room temperature. Steeped In Simple Syrup: Transfer the simple syrup to a large mouth clamp-down lid jar. Roughly tear and crush the mint leaves to release the essence. Add them to the simple syrup in the jar and stir to incorporate. Let the syrup and mint steep for at least 12 hours in a cool, dark space. Shake occasionally to encourage a good infusion. 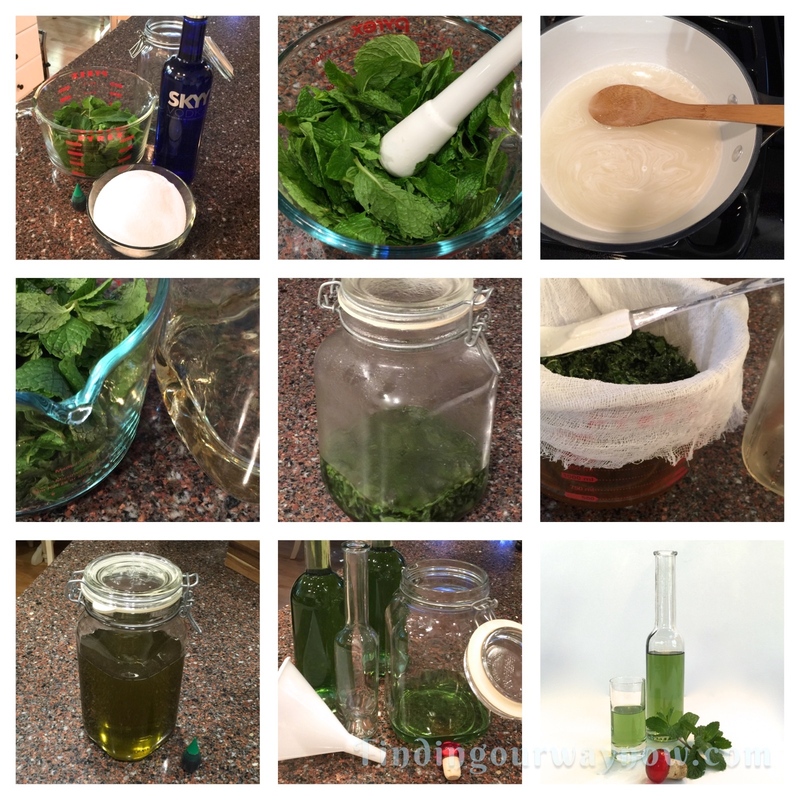 Steeped In Vodka: Roughly tear and crush the mint leaves to release the essence and add to a large open mouth clamp-down lid jar. Pour the vodka over the prepared mint leaves. Clamp down the lid and vigorously shake the contents to incorporate. Let the vodka and mint steep for at least 24 hours in a cool, dark space. Shake occasionally to encourage a good infusion. Using a double layer of cheesecloth, strain the infused liquid into a large bowl removing all the mint leaves as well as any residue and discard. Squeeze the cheesecloth to get all the infused liquid into the bowl. Transfer the strained infused liquid to a clean large wide mouth jar with a clamp-down lid. Add the infused vodka, simple syrup (or infused simple syrup and vodka) and pure mint extract, clamp down the lid and shake vigorously to combine. Let the mixture stand in a cool dry place for at least 24 hours. At that time, the liquid will be a clear green-brown color, without any residue. Add a drop or two of green food coloring and stir to incorporate into the crème de menthe to achieve a medium to dark green color. Bottle the homemade crème de menthe into decorative glass bottle of your choice, add a label and a bit of ribbon and you’re good to go for any occasion. It’s good to refrigerate your Homemade Creme de Menthe before serving. The longer it ages the better it gets. You can store it in the refrigerator or freezer for up to 1 year or more. Aside from serving it chilled in a glass by itself, try adding a bit of crème de menthe to your favorite hot chocolate, homemade ice cream with chocolate chips for a mint chocolate chip flavor or maybe homemade chocolate truffles. It’s a great liqueur that’s easy to make and can add so much to some of your recipes. If you enjoyed my “Homemade Crème de Menthe,” check out my Homemade Limoncello, Homemade Mulled Wine, or my yummy Irish Coffee With Honey. Enjoy.